the property of a good or a commodity whose individual units are capable of mutual substitution. Examples of highly fungible commodities are crude oil, wheat, orange juice, precious metals, and currencies. Fungibility is the central part of the argument over the news a month or so ago when it was announced that German financial services organization Deutsche Boerse was building a cloud exchange platform, the Cloud Exchange AG. The vendor-neutral marketplace for cloud compute and storage is planned to launch sometime in 2014. Cloud brokerage is a concept that has been talked about for a long time. SpotCloud, a product created by Enomaly (now owned by VirtuSteam), launched a few years ago to provide just this service – arguably its timing was early and it never managed to gain traction. There are many who suggest that there is no future in cloud brokerages (more on the debate here). As an aside I’ll be moderating a panel next month in London which sees Ruediger Baumann the CEO of brokerage platform Zimory, John Cowan the Co-Founder and CEO of 6Fusion and James Mitchell the founder and CEO of Strategic Blue discuss the concept. Zimory has been in existence since 2007, has 75 or so employees and is headquartered in Berlin. Zimory also has development centers in Erfurt, Germany and Minsk, Belarus, and a subsidiary office in New York City The company has already worked with a small group of buyer and sellers to establish some common interfaces to enable the transactions (and underlying service provision) to occur and is next going to do some work to allow infrastructure providers using different technology stacks to describe their service in a common way to effect a frictionless transaction. In order to list on the exchange, vendors will need to go through a certification process – this will cover SLA’s and IO levels but not technology standards. Zimory believes that its platform has the ability to standardize disparate IaaS products sufficiently to effect the transaction. There are two issues here we need to think about, and that we’ll dive into at Structure next month. How Fungible is IaaS Really? The big discussion around cloud technologists when it comes to a debate about whether cloud marketplaces are viable or not centers around the general contention that there is no common core to IaaS. A marketplace for electricity, for example, can resolve all the different methods of generation (hydro, solar, nuclear etc) into a simple measure, the kilowatt-hour. IaaS on the other hand, has no such simple unit of measure. There is no “compute-hour” or “storage-block” that we all accept as standard. This is becoming ever more the case as vendors (most notably AWS) move further up the stack and deliver differentiated services on top of simple compute and storage. We then have vendors such as ProfitBricks that are talking about new measures when it comes to IaaS – their combining of price and performance makes sense when it comes to a vendor comparison, but makes a common marketplace all the more difficult. The Boerse recognizes this and is implementing ways of obtaining quasi-consistency around location, SLA and transfer speed. The question remains whether this is enough, any discussion with technologists clearly arrives at a stalemate as the technologists remain adamant that there isn’t sufficient commonality among IaaS vendors to effectively create a marketplace. My belief is that one of the main reasons cloud marketplaces haven’t really succeeded thus far is that the discussion has been held between technologists – the same people that see the logistical challenges of moving between IaaS vendors. I believe that marketplaces for IaaS, much like marketplaces for other items, DO have a place, but the conversation needs to be moved away from a technological one. The key driver for the emergence of cloud marketplaces is the pressures upon CFO and other financially focused staff to deliver on fiscal requirements – I believe then that the Cloud Exchange, focused as it is on a conversation primarily between the financial decision makes of both the buyer and seller, is more likely to be successful that previous incarnations. The second issue around building a vibrant marketplace still exists however. What of that AWS Elephant? I put it to Baumann that even if the parties could find a common measurement that would allow effective brokering of cloud services, the very significant fact remains that at this time the vast majority of cloud usage is delivered by one vendor – AWS. This fact was borne out in a recent GigaOm post where Barb Darrow commented on the relative growth in revenue between AWS and Rackspace (see chart below). 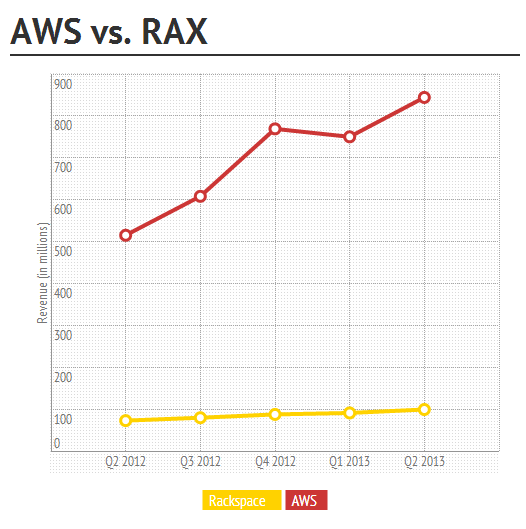 Despite the fact that AWS revenue far outstrips that of Rackspace, AWS is still enjoying a far steeper growth curve This suggests that the relative distance between AWS and RAX (and, by extension, other AWS competitors) will continue to broaden. Given this fact it’s hard to see any real demand today, and less so into the future, for multi vendor cloud marketplaces. Baumann countered this perspective by pointing out that global adoption of cloud is well under 10% of total infrastructure spend. Given this tiny figure, and the fact that some of the largest IT spenders (banks etc) have been somewhat slow to move to the cloud, he believes that these more discerning customers need higher levels of service, more choice and, by extension, a more vibrant and hence secure marketplace to really go out on a limb with the cloud. Part of creating this vibrancy will come from a diverse and tradable market of cloud providers. It is also interesting to look at the perspective of James Mitchell from Strategic Blue who talks often about the flexibility that customers want in terms of how they buy cloud services. While the AWS Reserved Instance product has helped somewhat to balance the benefits of on-demand with the security of fixed provision, it is a generic approach to the problem and can’t hope to meet all customers needs – this is where a company like Strategic Blue comes in who can act as the intermediary between vendor and customer and be the “translation layer” between the two parties financial needs. Cloud brokerage, futures, trading or whichever name you like to apply to it is a fascinating area. That said, the bottom line is whether or not there is both the ability for what they offer to occur and sufficient call for what these vendors are providing for them to build viable businesses. Is IaaS sufficiently fungible for marketplaces to flourish? Are there enough willing buyers and sellers, and enough margin to be made, for these financial intermediaries to survive. A couple of pretty massive unknowns in there and I’m looking forward to digging deeper into the topic in London next month. Much looking forward to your comments post deep dive in London. Couple of things stand out, first the CFO postulate, as regards driving acceptance and subsequent consumption of cloud brokerage offerings. Seems a bit premature, as the finance side of the equation would be a factor, but not a mission critical one, as interoperability amongst commoditized instances is greatly dependent on the underlying technology stacks, as per IaaS vendor’s existing capabilities. And here, we have to face the fact that the uptake has been slow and will continue to be such, until the existing platforms (stackwise) mature enough in their functionality, to offer compatible units of utility, to be traded based on whatever computational tasks are required, in real time. Furthermore, it is unclear, how the fragmentation/cross-compatibility amongst all the existing stacks is going to shape out over the next few years. Case in point, AWS vs Rax – if one were to look as to why AWS is able to move further up the stream on their stack differentiation offering, one may find that the underlying capabilities to of IaaS providers to customize their offerings is directly related to Size and Stack choice..i.e. RAX’s bet on OpenStack may not leave it enough space to maneuver in the race with AWS to deliver sufficiently attractive value prop for enterprise customers. Nice attempt to explain what could be if IaaS was fungible, tech integrations withstood innovation, and CFO’s were not risk-savvy. Unfortunately, these 3 points, with 99% certainty, eliminate the chance for success of the IaaS Cloud Exchange as described for 2014 launch. As technology standards evolve and solidify maybe the world changes, but in the best case we are a decade (if not decades) away from the required level of commonality for an exchange to work. The most unfortunate aspect is not technology moving slowly, but that the fungibility of IaaS platforms is not in the interest of successful vendors, but the “aspiring” ones. Its not that I don’t believe that open standards won’t win in the end, its just that the end is far in the future. One day the IaaS sun will shine on Rackspace, but that day is not close. An exchange for IaaS is only useful once there is interest to frequently changing IaaS _and_ the risk with changing IaaS is minimal. The risk in changing IaaS is still huge. In fact I have never heard of anyone doing it without running into problems for enterprise apps (scientific computing is more self contained — less dependent on a broader ecosystem). Just within IaaS, the boundary between Compute, Storage, and Network is rough to navigate. Alas, the user’s business depends on business sw functionality (SaaS), not IaaS. So the risk in changing IaaS contains a lot more uncertainty than changing PaaS or SaaS. It is the difference of gutting the basement of a skyscraper vs. the 50th floor: a mistake in the basement affects all the floors, so better be careful with those wire cutters. This discussion of risk is something the CFO’s get, not to mention the political limb they would be on if they pushed the change of the IaaS vendor, only to result in 18months of intermittent production system glitches (like the last time they changed the storage vendor). There might be some naivete in expecting that an integration orchestration layer and certifications will mask the problems of exchanging IaaS vendors. No doubt they will help, but technology changes will explode the certification permutations as well as the costs and risks. At least from my enterprise apps experience, this will not be an easy feat. Finally, lets assume that I am wrong: in 2014, there is a whole bunch of applications (maybe non-production, maybe non-enterprise class) which can be smoothly transit across IaaS vendors. The stacks those IaaS vendors use are available to the IaaS users, as is the same pool of talent needed to operate them. And it is much cheaper to implement a private IaaS cloud vs use a public IaaS cloud (as well as dedicated/pinned/reserved infrastructure, previously known as hosted or coloc’s depending on who paid for hw capex). The CFO can play the capital vs operating costs game, but the economics are stark enough to arrest that. Thus, it is the private clouds, coloc’s/hosting solutions, who will be the ultimate winners from fungibility of IaaS, whenever it comes. As for the Exchange or Rackspace, I think they would have more success trying to run-around AWS by focusing on the top of the stack (SaaS/hybrids) vs IaaS. There’s no incentive for enterprise IaaS vendors to play in a marketplace that will only offer price differentiation. That’s not how they win deals. The offerings are still significant enough in their differences that for large accounts they warrent enterprise sales professionals. I hope your panel will include not only representatives of companies who stand to benefit from creation of IaaS cloud marketplace but also reps of those companies whose problems said marketplace is expected to solve. Reasons you outlined in this post, coupled with aspects I talked about in a blog 2.5 years ago (http://www.somic.org/2011/01/19/my-doubts-about-idea-behind-spotcloud-com/), lead me to believe that as of now cloud marketplace where end users buy compute or storage capacity will not take off – it’s simply not needed, it can solve problems for marketplace operators (additional business) and suppliers (reach additional customers for unsold capacity) but it doesn’t solve enough problems for buyers. Finance people looking to capitalize on cloud should be looking beyond an obvious idea of cloud marketplace. It seems to me that many discussions about interchangeable IaaS clouds underestimate the pain of doing migrations in all but totally stateless applications. Given that there is IaaS price competition and fixed cost in moving, how’s this going to be a huge business? In other areas of IT vendor has more monopoly power than than basic IaaS (EC2,EBS,ELB) and not being “locked-in” is a real concern.